Micromega MyDAC review | What Hi-Fi? The Micromega MyDAC is part a new range of compact and affordable audio components – a line-up which will also include an MM/MC phono amplifier, a headphone amplifier and a wireless streamer, among others. But first, the MyDAC – unleashed at the 2012 High End Show in Munich, the device is designed and built in France, and will cost you £260. The compact box comes in a matt-black (as in our review sample) or a glossy white finish. It’s a surprisingly light box, weighing just 300g. 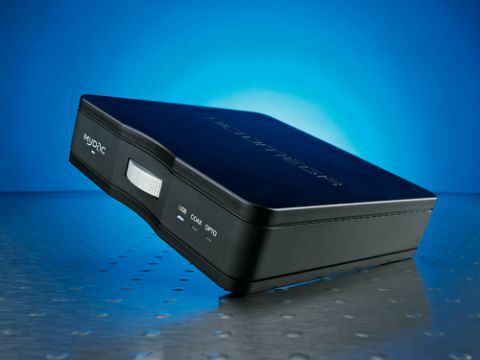 That’s the same as the smaller Arcam rPAC, but the Micromega MyDAC doesn’t quite have the same premium, weighty quality of build and finish as rivals like the Arcam. We’d be careful when connecting up the MyDAC with the rest of your system, as we found that heavy cables can drag on the light box and move it out of position. The rear panel houses all the connections, which include the mains power, a pair of line-level RCA outputs, and digital optical, coaxial and type B USB inputs. On the front, there’s an anodized aluminium rotary wheel: turn it to switch between standby mode, and the USB, coaxial or optical inputs. The asynchronous USB design ensures low jitter levels and allows playback of 24bit/192kHz files, while a switch at the rear panel gives you a choice of USB 1.0 or 2.0 operation. This is a nice touch from Micromega, as not all computer drivers are compatible with the class 2.0 option (which allows for high-resolution 24-bit/192kHz files), and the class 1.0 option (up to 96kHz) ensures better compatibility. Two USB master clocks inside are aimed at reducing jitter levels. Start playing some tracks from a laptop, and the Micromega delivers clear and punchy notes. Select Elephants by Them Crooked Vultures, and the MyDAC drives the tune along with plenty of energy, fully conveying the grungy, attacking sound. There’s solid weight to all the instruments, while decent dynamics and timing work effectively together to produce a fast-paced and exciting perfomance – just what the track needs. There is a slight hardness and brightness to the edge of notes, however – rather like the Audioquest DragonFly – which means tracks that thrive on excitement and attack pair up well with the MyDAC, whereas gentler pieces of music have an unnaturally hard edge to them (as witnessed on a WAV recording of Amanda Palmer’s The Bed Song). It’s an approach that the MyDAC lends to all types of music, and it’s hard to ignore. From Spotify streaming to the higher-resolution 24-bit/192kHz files, there’s an obvious jump in quality, but the Micromega’s tonal character lingers. Beethoven’s Piano Concerto No. 3 (in 24-bit/192kHz) could do with more layers of detail and melody wrapped around it for a more involving listen. The Micromega MyDAC falls just short of being an all-round wonder, then. But don’t let that deter you: this DAC has heaps of energy and attack.